“Rock is dead” pronounced Kiss’s Gene Simmons, never a man to hold back on his opinions. But that would seem a highly difficult concept to explain to anyone seeing 80,000 people flooding into Wembley Stadium for AC/DC on this hot July evening. Of course, Simmons was talking about the rock bands of the future, but more of that later. Five years since their last world tour ended and five years since they last played in Britain, the band’s recent well-publicised problems (founder Malcolm Young tragically forced into retirement by dementia and drummer, Phil Rudd, removed from the band following court appearances on a range of charges including murder threats) have done nothing to dim the level of interest and excitement in this latest tour. And what a memorable night this has turned out to be. For a gig this size the sound is utterly brilliant, helped I am sure by the huge wall of Marshall Amps neatly stacked up across the back of the otherwise Spartan stage. Stevie Young, replacing Malcolm, delivers the grinding trademark guitar sound made famous by his absent uncle; while Chris Slade, back with the band after an absence of two decades, is a hugely powerful drummer ensuring he and bassist, Cliff Williams, provide an unrelenting rhythm throughout the evening. 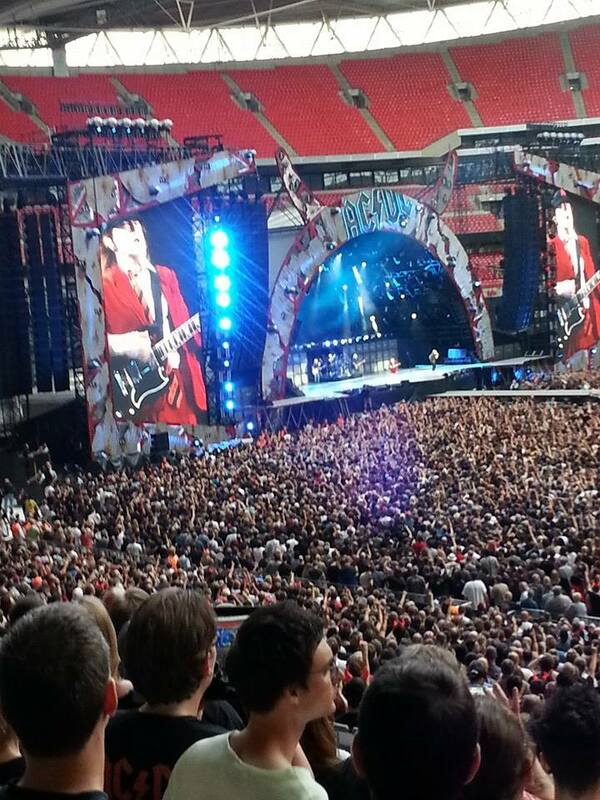 Vocalist, Brian Johnson, is in excellent form for a man of his age and Angus Young’s lead guitar is as spellbinding as ever. The two hours whizz by and a following a spectacular version of Let There Be Rock and a lengthy guitar solo that’s still as manic as anything I ever saw from Angus Young thirty-odd years ago, the crowds are calling for an encore and the band return to the stage for an unmissable Highway to Hell and a spectacular For Those About to Rock, complete with canon gun fire and pyrotechnics. While rock music has undergone many different permutations, adaptations and reinventions since rock ‘n’ roll first came on the scene, apart from the increase in power and volume, AC/DC’s songs and riffs have not really deviated from that basic musical template that was set for rock ‘n’ roll back in the mid-fifties. This must have played a major part in the band’s success and longevity, playing songs that are accessible, instantly recognisable and that can be sung along to in a way that most heavy rock or metal bands could only dream of. And when AC/DC finally stop playing, these 80,000 people here tonight (representing a very healthy mix of male and female fans and a hugely varied range of age groups from teens upwards) are they all going to give up on live rock music altogether? I very much doubt it. Rock is very much alive and AC/DC, themselves, are playing a big part in ensuring it will long outlive them.